To register online, please visit our class schedule page. From here, you may choose and purchase a class or classes to attend. To register for each class, please visit the date the class is offered and click the “sign up” button. Note: Discounted rates are available at the studio or in person upon request. Need help or have questions? Call us at 207-805-0183. If you park your car in our parking lot, please use one of the spaces marked AOA or SPHA. Parking is also available on Waterman Drive, B Street, and C Street. Note: AOA clients should avoid parking in any space labeled “FAH Private” as they may be towed. Class cancellations will be posted on our online schedule, our facebook page, and local news sources. We will post cancellation information no later 90 minutes prior to the scheduled start time of class. Please plan to arrive 15 minutes prior to your first class at the studio to orient yourself to the space and sign in. To maximize your experience and minimize disruption to other students, please plan to arrive at least 5-10 minutes prior to class start time for all other classes. Please remove your shoes in the waiting area before entering the practice studio. Most classes will be practiced barefoot. (For Qigong/Tai Chi Classes, indoor only shoes are optional). Please turn off/silence and put away any cell phones or noise-making devices. If you arrive late to a class, please do not enter the studio during any opening chanting. To respect the experience of all students, we ask that you wait outside the door until the chanting has completed and then quietly enter. 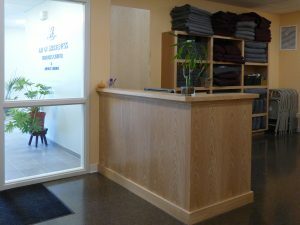 We encourage students to stay throughout the practice including final relaxation. If you must leave a class early, however, please inform the instructor prior to the start of class and leave before the start of final relaxation. We want your experience to be both positive and safe. Please let the instructor know of any medical conditions or physical restrictions/special needs prior to the start of class. Bridge Studio is fragrance free. Please refrain from wearing strong scents when coming to class. Exception: Specialty classes and workshops that include essential oils as advertised. Bridge Studio class cards will be accepted for any class except some series classes, workshops and Yamuna Body Rolling workshops. To ensure your spot in the class you are interested in, we encourage you to register in advance whenever possible. Individuals coming to only one class may choose our drop-in rate. However, many people choose one of our convenient class card options. Donation-Based Classes: Paying online will allow you to pay by credit card in $5 to $25 increments, or you may choose to pay in person by cash, check, or credit card for another amount. The suggested minimum donation is $6 and donations generally range from $6 to $20. Sliding Fee Classes: $5/$10/$12/$15 or class card may be used. We encourage you to sign up for classes in advance. Online payment to secure your space in a class is refundable if you cancel with at least 2 hours notice from the scheduled start time. Online Payment for a class is non refundable if you cancel with less than 2 hours notice. If you have signed up for a class that is full and do not arrive within 5 minutes of the start time your spot may be given to the next person on the wait list. Our Workshops Cancellation Policy states that we require a 5 day notification for a full refund minus a 20% administrative fee. If you give us a minimum of 48 hours notice, we will provide you with a studio credit. When you give us less that 48 hours cancellation/absence is non-refundable. Our Private Sessions Cancellation Policy states a minimum of 24 hours notice is required for studio credit. Less that 24 hours notice is non- refundable.